A mystic poet of New England, Jones Very was born in Salem, Massachusetts. 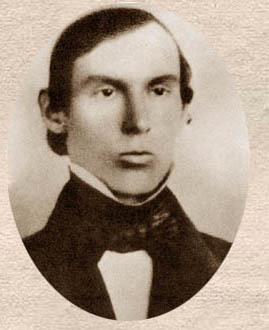 The son of sea-captain Jones Very was nine years old when he went to sea with his father for two years before his father died prematurely in 1824. His mother scorned religion and complained about the family’s poor fate. Nevertheless, her son was accepted at Harvard College with advanced status as a sophomore and graduated with second highest honors in the class of 1836. His conduct was so exemplary that he was appointed as a tutor in Greek. Very was loved by his students, but the administration compelled him to resign when he advised students: “Flee to the mountains, for the end of all things is at hand.” Christ was returning in Jones Very’s own being. President Quincy was not impressed and wondered if the tutor was insane. Very was free after spending one month at McLean Asylum. When transcendentalist educator Elizabeth Palmer Peabody heard Very lecture, she communicated her enthusiasm to Ralph Waldo Emerson, who had just delivered his famous Phi Beta Kappa address on The American Scholar in the Harvard Square Meetinghouse. Emerson soon spent five days with Very and edited the publication of the mystic-poet’s Essays and Poems in 1839. The volume consists of sixty of the three hundred poems Very had written in eighteen months plus two impressive essays: “Shakespeare” and “Hamlet.” Nevertheless, Emerson paused when Very wanted no changes of the poems since they came by divine inspiration. Emerson explained that it was doubtful that God used such poor grammar, and he made other revisions of the manuscript, eliminating bizarre poems. Although Very was invited to the Transcendental Club, Emerson’s interest in the young mystic soon waned. In 1843 Very was licensed to preach as a minister and did pulpit supply assignments in Maine and Massachusetts, though he lacked any type of steady employment. He lived with his atheistically outspoken mother, who now surprisingly affirmed her son’s views. When she died, he lived quietly at home in Salem with his two sisters until he died. The Rev. James Freeman Clarke, who maintained that instead of monomania Very had “monosania,” edited the 1886 edition of Poems and Essays. Professor Helen R. Deese edited The Complete Poems in 1993. Nor biting cold of frosty air. His hiding place not yet he leaves. I saw him crawl from out his shell. It soared on golden pinions free! The unseen hues of immortality. Of whom our histories tell us but the name! Of Love and Beauty ever to remain.